Chainfree Bristol - February News 2012! Meet Buster! Buster is a 10 year old Border Collie permanently chained to a tree, living in his "circle of dirt". In the same Bristol, TN backyard lives Jackie, a seven year old Jack Russell and Jethro, a four year old Rottie both living in too small kennels! They barked constantly when anyone entered the backyard space! NOW BUSTER, JACKIE and JETHRO HAVE A NEW, large, backyard enclosure and are chain free thanks to Chainfree Bristol! Here Chainfree Bristol volunteers, Les and Liza (above) and Eden and Les (below) work on the fence. BUSTER, JACKIE and JETHRO are now CHAINFREE! Laws are popping up all over the country, just like the tiny crocus will soon! TAMPA - Hillsborough County commissioners voted unanimously Thursday to ban the practice of tethering dogs. The only dog tethering to be allowed under the new ordinance would be if the owner, keeper, or harborer of the dog is present and in visual range of the dog while the tethering occurs. Violators of the ordinance would face a civil citation. The county will allow six months of education about the new ban before enforcing the law. "I think it's time people get with the 21st century and realize that the way we treat our animals needs to progress with the 21st century," said Barbara LaPresti, organizer of the grassroots group who fought for the ordinance . The cruel chaining of dogs is something that Floridians, and their elected officials, care about deeply. Now that Hillsborough County has passed an ordinance, five of the top six most populous counties in Florida (Miami-Dade, Palm Beach, Hillsborough, Orange and Pinellas) have ordinances restricting the cruel chaining/tethering of dogs. The only hold-out: Broward County. Anyone with a dog in Vancouver faces a $250 fine if they leave their pooches unattended - even if they are secured outside a grocery store or restaurant. Tom Hammel, assistant director of licenses and animal control division, said the city is intent on educating people on the decades-old bylaw that is now just being enforced. "It's a safety issue for us," said Hammel, who suggested any focus would be on tied-up dogs that were aggressive or neglected. These terms refer to the practice of fastening a dog to a stationary object or stake, usually in the guardian's backyard, as a means of keeping the animal under control. These terms do not refer to the periods when an animal is walked on a leash. Dogs are naturally social beings who thrive on interaction with human beings and other animals. In the wild, dogs and wolves live, eat, sleep, and hunt with a family of other canines. Dogs are genetically determined to live in a group. A dog kept chained alone in one spot for hours, days, months, or even years suffers immense psychological damage. An otherwise friendly and docile dog, when kept continuously chained, becomes neurotic, unhappy, anxious, and often aggressive. In many cases, the necks of chained dogs become raw and covered with sores, the result of improperly fitted collars and the dogs' constant yanking and straining to escape confinement. Some chained dogs have collars embedded in their necks, the result of years of neglect at the end of a chain. In addition to The Humane Society of the United States and numerous animal experts, the U. S. Department of Agriculture (USDA) issued a statement in the July 2, 1996, Federal Register against tethering: "Our experience in enforcing the Animal Welfare Act has led us to conclude that continuous confinement of dogs by a tether is inhumane. A tether significantly restricts a dog's movement. A tether can also become tangled around or hooked on the dog's shelter structure or other objects, further restricting the dog's movement and potentially causing injury." In 1997, the USDA ruled that people and organizations regulated by the Animal Welfare Act cannot keep dogs continuously chained. The American Veterinary Medical Association (AVMA) has also stated "Never tether or chain your dog because this can contribute to aggressive behavior." Numerous attacks on people by tethered dogs have been documented. The Journal of the American Veterinary Medical Association reported that 17% of dogs involved in fatal attacks on humans between 1979 and 1998 were restrained on their owners' property at the time of the attack, and the book Fatal Dog Attacks states that 25% of fatal attacks were inflicted by chained dogs of many different breeds. Tragically, the victims of such attacks are often children who are unaware of the chained dog's presence until it is too late. Furthermore, a tethered dog who finally does get loose from his chains may remain aggressive, and is likely to chase and attack unsuspecting passersby and pets. Leaving a dog on a chain and ignoring him is how to raise an aggressive dog. Aggressive dogs can't distinguish between a threat and a family friend, because they are not used to people. Aggressive dogs will attack anyone: children who wander into the yard, the meter reader, the mailman. Statistics show that one of the best deterrents to intruders is an inside dog. Intruders will think twice about entering a home with a dog on the other side of the door. In addition to the psychological damage wrought by continuous chaining, dogs forced to live on a chain make easy targets for other animals, humans, and biting insects. A chained animal may suffer harassment and teasing from insensitive humans, stinging bites from insects, and attacks by other animals. 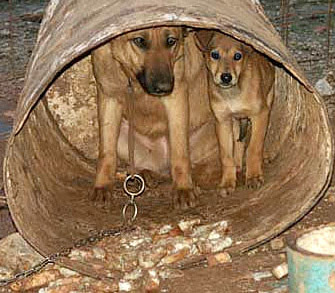 Chained dogs are also easy targets for thieves looking to steal animals for sale to research institutions or to be used as training fodder for organized animal fights. Finally, dogs' tethers can become entangled with other objects, which can choke or strangle the dogs to death. What's more, because their often neurotic behavior makes them difficult to approach, chained dogs are rarely given even minimal affection. Tethered dogs may become "part of the scenery" and can be easily ignored by their owners. Dogs should be kept indoors at night, taken on regular walks, and otherwise provided with adequate attention, food, water, and veterinary care. If an animal must be housed outside at certain times, he should be placed in a suitable area with adequate square footage and shelter from the elements. Animals who must be kept on a tether for a short time should be secured in such a way that the tether cannot become entangled with other objects. Collars used to attach an animal should be comfortable and properly fitted; choke chains should never be used. Restraints should allow the animal to move about and lie down comfortably. Animals should never be tethered during natural disasters such as floods, fires, tornadoes, hurricanes, or blizzards. 14. What about attaching a dog's leash to a "pulley run"? Attaching a dog's leash to a long line—such as a clothesline or a manufactured device known as a pulley run—and letting the animal have a larger area in which to explore is preferable to tethering the dog to a stationary object. However, many of the same problems associated with tethering still apply, including attacks on or by other animals, lack of socialization, and safety. 15. What can be done to correct the problem of tethering dogs? More and more communities are passing laws that regulate the practice of tethering animals, including Duram, Chapel Hill, Raleigh, Fayetteville, and other cities and counties in North Carolina. In addition, Miami, Fl, New Orleans LA, Tuscon AZ, Okaloosa FL, Carthage MO, Lawton, OK and other cities ban all chaining. The state of Connecticut, along with Wichita KS, Denver CO, Austin TX, Norfolk VA, West Palm Beach FL, and others allow dogs to be chained only for a limited number of hours a day. Animal control and humane agencies receive countless calls every day from citizens concerned about animals in these cruel situations. Animal control officers, paid at taxpayer expense, spend many hours trying to educate pet owners about the dangers and cruelty involved in this practice. Regulations against chaining also give officers a tool to crack down on illegal dog fighting, since many fighting dogs are kept on chains. A chained animal is caught in a vicious cycle; frustrated by long periods of boredom and social isolation, he becomes a neurotic shell of his former self—further deterring human interaction and kindness. In the end, the helpless dog can only suffer the frustration of watching the world go by in isolation—a cruel fate for what is by nature a highly social animal. Any city, county, or state that bans this practice is a safer, more humane community.